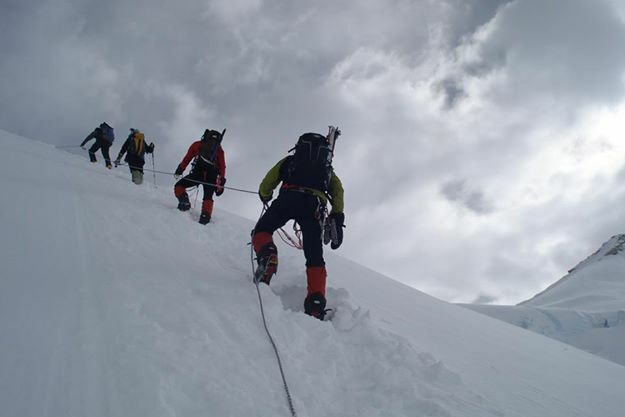 This is a classic trek to Lobuje Peak , one of the highest trekking peaks in Nepal . Lobuje, also spelt as Lobuche, has two distinct summits, Lobuje East [6,119 m] and Lobuje West [6,145 m]. Though they are connected by a continuous ridge, there is a sharp gap and a considerable distance between them. This trek takes you to the East Peak. ; in order to trek to the Lobuje West you need an Expedition permit. Lobuje Peak is an attractive summit and offers a variety of trekking routes, some already existing and other probable ones. When seen from near Pheriche, the dark triangle of its rocky East Face rises above the moraines of the Khumbu Glacier to an icy skyline. This skyline forms the South Ridge, the junction of the East Face with the glaciated route of ascent. This in turn leads to the summit ridge running north-west from the top of the East Face through several small summits to the East Peak .